Image Attribute: Lee R. Raymond, Former Chairman, and CEO ExxonMobil Corporation receiving his 2018 Abdullah Bin Hamad Al-Attiyah International Energy Awards for Lifetime Achievement. Doha, April 14, 2019 – Lee Raymond, Former Chairman, and CEO ExxonMobil Corporation, and winner of last year’s Honorary Award for Lifetime Achievement, led the Selection Committee for the 7th Abdullah Bin Hamad Al-Attiyah International Energy Awards for Lifetime Achievement. The Abdullah bin Hamad Al-Attiyah International Energy Awards are given annually to individuals for their Lifetime of Achievements in the advancement of the global energy industry in seven categories. The nominees are voted on by an International Selection Committee who choose candidates for an outstanding record of accomplishment in their sector over the whole of a career; men and women who have made an exceptional impact on the energy industry with distinct personal achievements for a consistent and prolonged period of engagement. The Abdullah bin Hamad Al-Attiyah International Energy Awards celebrate the unprecedented work of H.E. Al-Attiyah, Chairman of the Al-Attiyah Foundation, Qatar’s former Minister of Energy & Industry and Deputy Prime Minister, by recognizing the career achievements of distinguished individuals in their service of the global energy industry. “I would like to single out H.E. Al-Attiyah, who has been a leading figure for the global energy markets – especially LNG – but also for his very own country of Qatar,” said Dr. Fatih Birol, Executive Director of the International Energy Agency and a 2016 Selection Committee member. “Wherever I go and whenever I talk about LNG throughout the world, I always call H.E. Al-Attiyah – the father of LNG”. The Al-Attiyah Foundation strives to ensure that the worthiest nominees globally are identified for their outstanding record of accomplishment in their category. In order to achieve this, a group of renowned figures is invited annually to join the Selection Committee to independently evaluate the nominees based on the following Criteria: Impact, Innovation, Long-Term Vision and Leadership. This year’s Committee also includes Sheikh Khalid Bin Khalifa Al-Thani, CEO Qatargas; H.E. Mohammad Sanusi Barkindo, Secretary General, OPEC;, World Energy Council; Maria van der Hoeven, Former Executive Director IEA and Mustapha Bakkoury, President at Masen (Moroccan Agency for Solar Energy). 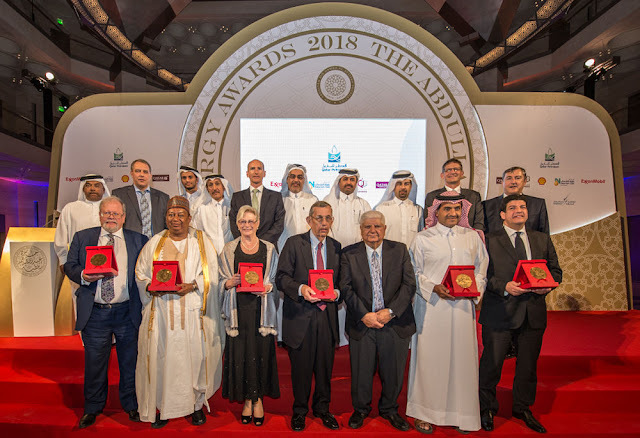 Image Attribute: The 2019 Selection Committee for the 7th Abdullah Bin Hamad Al-Attiyah International Energy Awards as the last year's winners. The 2019 winners will be presented their Awards at a Gala Dinner event held at the Sheraton Doha on May 1st, sponsored by Qatar Petroleum, North Oil Company, ExxonMobil, Shell, Qatar Airways, Total and Dolphin Energy. This year’s event is also proud to count on the following media partners: Bloomberg, Upstream, Gulf Times, Lusail News, Qatar Today, Qatar Al Youm, Energy Intelligence, Times Qatar and Tank Storage Magazine.